The subject of identification by shape can be a daunting topic, so it is beneficial to start off with what you are already familiar with. Since we are discussing sparrow identification, a great place to start is with the Song Sparrow. Through the rest of this discussion on shape I will compare other species to Song until we get to sparrows that are too dissimilar in future posts. 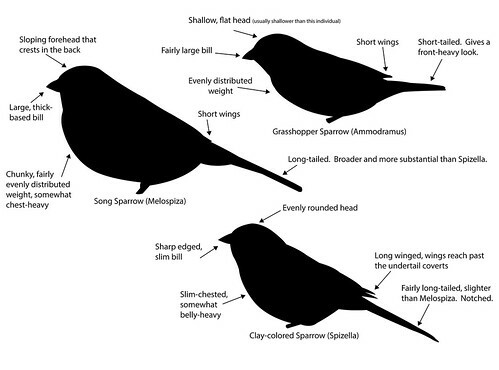 Overview of shape differences between Melospiza, Ammodramus, and Spizella Sparrows. The tail length of sparrows is extremely important to the overall look of a bird and can help to quickly identify some species in flight. When speaking of tail length, it is in comparison to the rest of the body. So this is a helpful feature even when the birds are not in direct comparison with other birds. The most common, widespread sparrow, the Song Sparrow, can quickly be identified by tail length in most situations. The Song Sparrow (Melospiza) has a long, rounded tail that is evident while perched and especially in flight. The Ammodramus sparrows have a very short tail that is also noticeable in flight. The Spizzela sparrows have a long, narrow tail that has a notched tip. The distribution of body weight can give different species of sparrows completely different looks. There are three main descriptions I use when describing different body weight distributions: evenly-distributed, chest-heavy, and belly-heavy. Each of the three genera discussed in this post has a different distribution (see the diagram). Bill shape and size can also impact the overall appearance of a bird. For the three genera discussed the bill shapes are a bit different. The Song Sparrow (Melospiza) has a deep bill with both mandibles being slightly rounded. This results in a bill that does not look finely-tipped. The Grasshopper Sparrow (Ammodramus) also has a large bill, especially in relation to body size. The shape of the bill is similar to that of the Song Sparrow, although somewhat slimmer and narrower based. The Clay-colored Sparrow (Spizella) has a more finely-tipped bill than the other two species. The straight-edged upper mandible creates this sharper billed appearance. The head shape of these three genera is fairly distinct. The Grasshopper Sparrow (Ammodramus) has a flat head that in many cases can appear to just be an extension of the head. The Clay-colored Sparrow (Spizzela) has an evenly rounded head although in some cases can look peaked at the back. The Song Sparrow (Melospiza) has an evenly sloping forehead that peaks in the back. In the case of these three genera the head size doesn't noticeably stick out, although Song Sparrows look quite large headed in some cases. The wing length of sparrows is quite variable, but most are fairly short winged compared to other families of birds. Both Ammodramus and Melospiza have short wings with little to no primary projection. However, the Spizella sparrows have longer wings with short primary projection (long compared to most sparrows though). This feature is worth noting as it changes the overall shape of a bird. Note: All of these features can change to a certain degree depending on the action of the bird so watching them for more than a couple seconds is important.